I have been quite busy with preparations for the new album, launch and other new projects so I haven’t updated my site in a while. 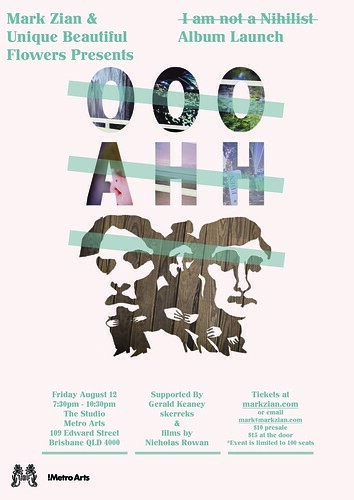 I will give a proper update soon however this is just a quick one to say that tickets are now on sale for the “I am not a Nihilist – No Ooo’s No Ahh’s No Audience” album launch on Friday August 12 at Metro Arts. Click on the I am not a Nihilist page or contact me at [email protected] for tickets. Posted in I am not a Nihilist, News. RSS 2.0 feed.